Sandeep Maini says that he is very positive about the Invest Karnataka initiative of the Siddaramaiah government. On November 15, Maini Precision Products (MPP) threw open its new aerospace manufacturing plant in Bommasandra. The 60,000 sqft space will play a crucial role in India's journey to becoming a superpower, working closely with programmes like Make in India and Start Up India. The idea, says Sandeep Kumar Maini, Chairman, Maini Group, is to establish air connectivity to tier 2 cities, a crucial boost for industry. Sandeep Maini, who is also one of the country's biggest art collectors, talks to Aksheev Thakur about a pioneering journey through industry and culture. A book rack runs around Sandeep Maini's office in Bengaluru and the walls are adorned with paintings - all testament to the culturally immersed Maini family. Over the years, the Maini group has established itself as one of the country's top design and manufacturing entities and stole its way into Bengalureans' hearts through the Reva, the first electric car. 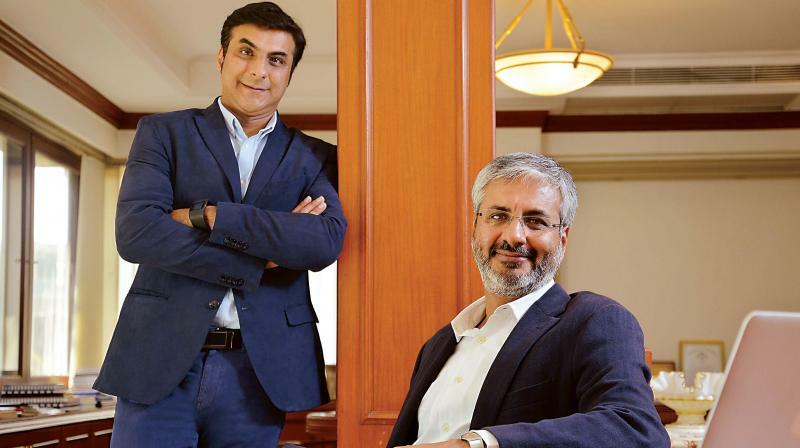 Maini had always imagined the small car to be the future of India, a dream that took flight when his youngest son, Chetan, went to study engineering at Michigan University. "Chetan got into the solar programme at Michigan and becam epart of the team that won the solar car race in the United States," Maini recalls. He then took part in programmes related to electric cars, which pushed him further in his search for alternative energy sources. The first two prototypes for the small, eco-friendly car were built in the U.S. in 1999. This is a point of pride for Sandeep Maini: Although they were built in America, the workforce and the raw materials were sent entirely from India. By 2006, the Maini group became the world's largest manufacturer of the electric car. Four years later, however, their prized business was sold to automobile giants Mahindra & Mahindra. It was a pioneering product, perhaps too early for its time, for the Reva floundered under lack of demand. "The push for electric vehicles wasn't strong either in India or on the global stage," said Maini. "New entrepreneurs came with great financial backing and we believed that sometimes, our objective should take precedence over personal ambition." The love and support they received from consumers, however, was satisfaction enough! Is the automobile sector venturing into the concept of electric mobility now? "These days, the portfolios of most of the Original Equipment Manufacturers have atleast one portfolio in their stable. These products should be launched over the next 18 months," Maini says. The Maini group has been closely involved with the central government's flagship initiative, Make in India. Maini believes that this is branding given to what industrialists have been attempting all along. "We have been doing good work but never thought in terms of branding," he remarks. "In fact, India was the exporter to General Motors! With Make in India, however, an umbrella was created, a template, really, of how we can do things." He calls the initatives one of the key catalysts in the industrial sector. On November 15, the Maini group set up a new aerospace plant at Bommasandra. Modi's government at the helm wants to connect small towns with big cities through air routes, which has been incorporated into the Udaan Scheme. He doesn't consider this imperative just for the employment sector - to Sandeep Maini, air connectivity might provide the industrial sector with the boost it needs. "It is essential that India move to tier II cities to increase employment," Maini maintains. People are incentivised when there is proper infrastructure in place and air connectivity is a vital cog in that wheel. "Connectivity is key," he says. "If that happens, industries an deducational sector will move there. He smiles when he is asked about Bengaluru's potential - "It offers a plethora of options ot newcomers and has an aura of professionalism about it," he says. "It's biggest advantage is that it doesn't have a history of family businesses. Nehru's Jewel - BEL and other premier institutes like HAL were set up here. It's the start-up capital of the world." The conversation veers to Maini's other love - art, which he says he gets from his wife. "There are many artists in the country who haven't received their due and the onus is me to ensure that their creativity reaches people," he says. Sandeep Maini exudes an air of optimism as the conversation comes to an end. He says that he is very positive about the Invest Karnataka initiative of the Siddaramaiah government as Karnataka has become one of the primary states to have designed solar, electric vehicles and aerospace policies.